"Vet" Russian Military WWII Combat Belt. Rare find! Own a piece of Soviet history. If this WWII Combat Belt could talk, it would tell of the harrowing challenges of keeping britches up during sub-zero temps, through artillery barrages and house-to-house fighting... all the way to Berlin! Metal buckle with star, sickle, hammer on front. Condition: used, in very good shape. Be among the first to own this rare relic from yesteryear! 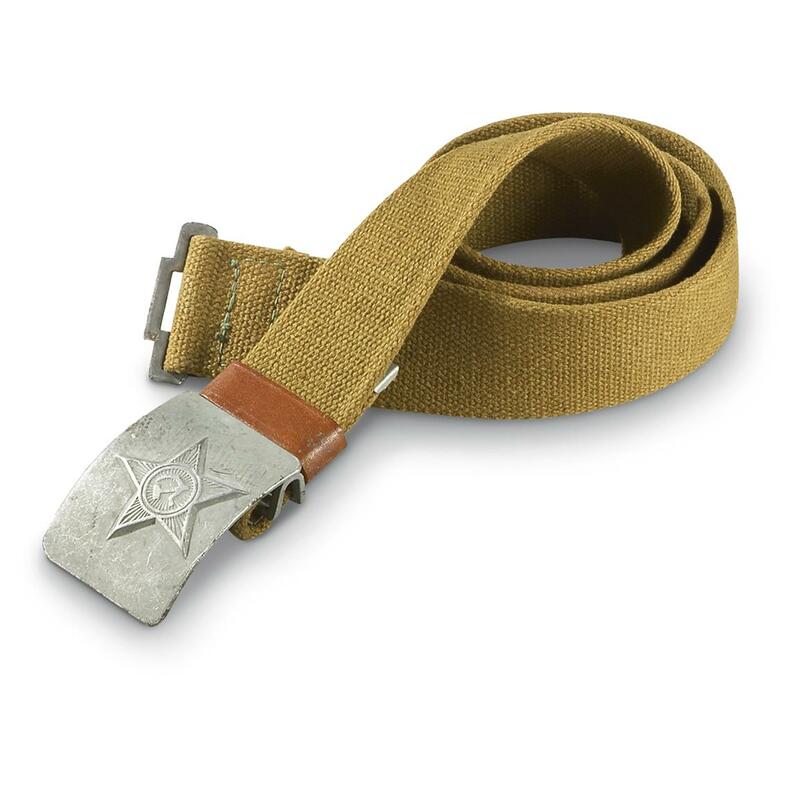 Used Russian Military WWII Combat Belt, Olive Drab is rated 4.7 out of 5 by 7. Rated 5 out of 5 by Tony from Great product The belt that I received was in excellent used condition. It could fight another war. Rated 5 out of 5 by Markdmdt from Great value Love having a piece of history that serves a practical purpose as well. Rated 5 out of 5 by EDWARD from this is very cool, fits probably up to 38 or 40 waist. definitly enlisted quality, the leather a bit dry but in good condition. easily managable. I have just started wearing it as a casual belt. looks like it might hold up with no problems. As for WW2 I don't know. could be later perhaps the 50's or 60's but can't say. I might buy a couple more just to put away. Rated 4 out of 5 by JIM JAMES from Very nice belt & buckle like new, made in 1956 or 1966 markings not real clear. As the other Russian items Post War. Rated 5 out of 5 by RAY from As advertised. Real World War 2 belt. Great condition. Rated 4 out of 5 by TROY from The belt looks new, I can't hardly believe it's from WWII. Rated 5 out of 5 by DOUG from the belts are excellant,just like the reat of your ww2 russkie stuff is. Carry extra gear where you can get at it.